Gantz Family Vineyards measures itself on quality and not quantity, but after last week's harvest, we were pleased with the results. As a relatively young and small vineyard experiencing only its fifth harvest, the main thing we want to see is improvement year over year. We were pleased to see growth in 2017, with an abundant amount of Pinot Noir fruit harvested and delivered to winemaker Kosta Browne Winery. As it goes with farming, it was down to the last minute before we were absolutely confirmed on the picking date/time. It was supposed to be at 2 a.m., Wednesday morning (September 13), so Celeste figured she had time to rehearse with her a cappella group Tuesday evening, come home for a nap, and start fresh. No such luck! Our vineyard manager, Jim Pratt of Cornerstone Certified Vineyard, announced that picking would start at 10 p.m., Tuesday night (September 12). So Celeste left rehearsal early and hit the ground running! We like to provide lots of "fortifications" for the crew; Clay made sure the crew knew where the snacks were and proceeded to make pot after pot of coffee. 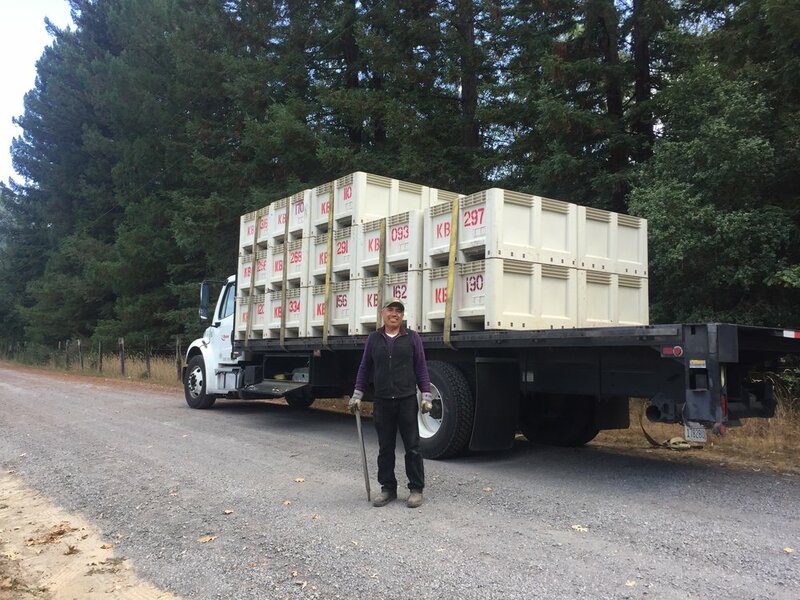 Even though Kosta Browne had delivered more bins than ever, we still needed to supply 2 of our own! Both of us help with the "sweep" harvest, picking up the grapes that the crews drop or miss. 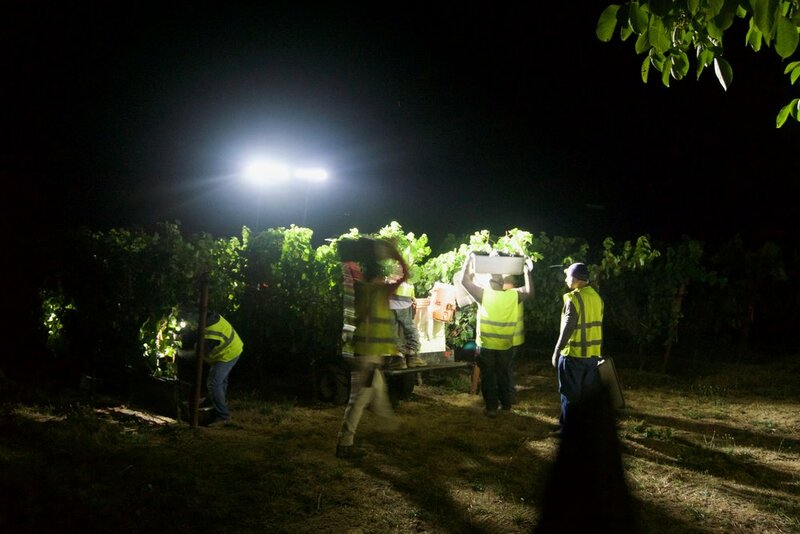 But later in the evening, it became apparent that because of our new leafing strategy, it was hard for the guys to find and pick the fruit, particularly in the Pommard and Calera blocks. So Celeste decided to go out and pull leaves away, just ahead of the crews; it's a task she's planning on taking on again next year. She can't do it all, but it certainly helps. Our new leafing strategy kept our fruit from getting sunburnt but also made it difficult to pick. Clay and Celeste followed the workers, getting at the fruit that they missed. The crew started at 10 p.m. and finished at 6 a.m., working through the mild, 61-degree night. Just as the last crew member emptied his tub into the bin, a few raindrops began to fall. As the last bin was fork-lifted onto the truck, the rain started to pour in earnest, complete with lightning and thunder. We couldn't believe our luck! The fourth cane in the Calera calmed the vines and resulted in better set. A new leafing strategy helped protect the grapes when we had the Labor Day heat spike. The grapes seemed to respond well to a regulated deficit irrigation strategy. Because it is farming, we have to give a big nod of thanks to Lady Luck. Our row orientation (E-W) combined with our leafing strategy helped to protect the clusters from the hot weather. An E-W row orientation is unorthodox, but we picked it (with counsel from our former vineyard manager Ulises Valdez and Kris Lowe) because of the way our site was laid out and because, in our spot in the Russian River Valley, we were not too worried about sunburn. This year was not ideal for growers by any stretch -- with heat spikes, wide temp fluctuations and rain during harvest -- so we feel like we were very fortunate. Missed the 2017 growing season? Sign up for our newsletter and receive occasional (VERY OCCASIONAL) emails about the latest events at the vineyard.